We live in an era where image is nearly everything, where the proliferation of brand-name culture has created, to take one hyperbolic example from Naomi Klein's No Logo, "walking, talking, life-sized Tommy [Hilfiger] dolls, mummified in fully branded Tommy worlds." Brand identities are even flourishing online, she notes--and for some retailers, perhaps best of all online: "Liberated from the real-world burdens of stores and product manufacturing, these brands are free to soar, less as the disseminators of goods or services than as collective hallucinations." In No Logo, Klein patiently demonstrates, step by step, how brands have become ubiquitous, not just in media and on the street but increasingly in the schools as well. (The controversy over advertiser-sponsored Channel One may be old hat, but many readers will be surprised to learn about ads in school lavatories and exclusive concessions in school cafeterias.) The global companies claim to support diversity, but their version of "corporate multiculturalism" is merely intended to create more buying options for consumers. When Klein talks about how easy it is for retailers like Wal-Mart and Blockbuster to "censor" the contents of videotapes and albums, she also considers the role corporate conglomeration plays in the process. How much would one expect Paramount Pictures, for example, to protest against Blockbuster's policies, given that they're both divisions of Viacom? Klein also looks at the workers who keep these companies running, most of whom never share in any of the great rewards. The president of Borders, when asked whether the bookstore chain could pay its clerks a "living wage," wrote that "while the concept is romantically appealing, it ignores the practicalities and realities of our business environment." Those clerks should probably just be grateful they're not stuck in an Asian sweatshop, making pennies an hour to produce Nike sneakers or other must-have fashion items. Klein also discusses at some length the tactic of hiring "permatemps" who can do most of the work and receive few, if any, benefits like health care, paid vacations, or stock options. While many workers are glad to be part of the "Free Agent Nation," observers note that, particularly in the high-tech industry, such policies make it increasingly difficult to organize workers and advocate for change. The phenomenon of corporate cultural dominance is of fairly recent origin. I highly recommend the book for a discussion of this. Naomi Klein presents a good description of how much of a presence multinational corporations have become in our lives. The material is well organized and very readable and although presented from a specific point of view alternative viewpoints are presented. To me the book raises more questions than it answers, but I do not mean that as a criticism. The book shows how corporations have moved into every facet of our lives, how their presence has become inescapable. Some questions raised are: Just how bad is this? What have we sacrificed in becoming a society of consumers? Why have we allowed it to happen? Is pop culture the only culture? What is the alternative? It took me awhile to get around to reading No Logo, and I have to say I was amply rewarded for the effort. Klein packs a whallop in her narrative as she covers the 80s and 90's corporate world as it switched from a product oriented climate to that of corporate branding with devastating consequences both at home and abroad. She does a great job of covering the terrain, pointing out the greed that permeated the market and the biggest abusers in this high stakes game of branding society. Probably the most disconcerting chapters are those where she illustrated how deeply these brand names permeated high schools and universities in the 90s, hoping to get to the "ground zero" of their youth market. She notes how schools basically sold their souls to the devil to make up for budget shortfalls brought upon by cuts in education budgets across the country. She also notes how students fought back, as they were sick of being forced to eat this branding in both their cafeterias and the single channel "educational" television programming they got in class. The book is as much about fighting back as it is about the media onslaught of major corporations to shape the way we think about their brands. She notes various efforts in the US, Britain and Canada to take back the streets, and remaking billboards and Internet ads into trenchant commentaries on the nature of branding. Perhaps her most searing chapters are those where she ventures into the sweat shops around the world, illustrating the widespread labor abuses of major brands, as they no longer take responsibility for their own products. Instead, a chain of suppliers provide these products at low costs so that the brands can spend more money on branding. It was an advertiser's heyday in the 90s, especially among 20-somethings as they found themselves to be hot property, with these companies seeking younger markets for their products. She notes the way Nike essentially "branded" Harlem, and how companies like Adidas followed suit when Run DMC's hip hop song about their Adidases became a big hit. This book offers a deep insight on how advertising are creeping into our lives, even conveyed to us in a subliminal way. If left unchecked, the corporations would be the authors our culture. It also showcases the exploits of major corporations in employment. However, one must be critical when reading the book, as some of the things Naomi bashes on, such as the Starbucks expansion strategy, are genuine business strategies. In some cases, we have to be realistic and not blindly adopt and anti-corporation stance. The first 3 chapters, No Space, No Choice, and No Jobs are exceptionally informative, but the last chapter, No Logo, falls short and descends into a boring rant on countermeasures that in my opinion, are far from effective and often, impractical. It was well written exploring many aspects of branding, culture jamming, and production. This book will leave you with frustration and questioning how you change change something, and what CAN you buy that isn't made from Export Processing Zones. This is a very, very interesting book regardless of what the "ending" or the "higher purport" may be and irrespective of the pseudo-intellectual nitpicking by a number of other reviewers. So get it, read it and enjoy it. Even if it doesn't ruffle your fancies, it brims with real factual evidence about the dark side of big business so at the very least you'll leave with some very interesting information off a single, compact compilation. The basic premise of the book is to highlight how advertising and general business practices have changed in the last twenty years. Essentially, companies decided that they were no longer in the business of selling products, because products are messy, duplicable, or even improvable. But if you are selling an idea, an experience, a set of associations, it is much harder for another company to compete with you. Think of Tommy Hilfiger for instance -- clothes manufactured in China and India for throw-away costs, but their designs are frantically devoured globally at horrendous price tags. This is why branding is big, and sometimes clandestine, business. The book is divided into four sections: 'No Space,' 'No Choice,' 'No Jobs' and 'No Logo.' 'No Space' is about the cluttering of our public spaces with ads; 'No Choice' describes different tactics used by big-name brands to drive independent retailers out of business; 'No Jobs' takes aim at sweatshop labour but with the corporations' "Brand, not products!" mentality in mind (it also includes details of Klein's trip to an Export Processing Zone just south of Manila); finally, 'No Logo' documents the global movement against branding and many of the organizations and people behind the revolt. 1. Klein's fluid writing style really shines throughout this book and her arguments are sharp and well targeted. 2. A delightful plethora of interesting, superbly researched facts and statistics that'll open your eyes, sometimes vis-a-vis brands that you'd least expect to be embroiled with anything ulterior. 3. I found that each section contained one exceptional chapter. In 'No Space,' "The Branding of Learning" (chapter 4) is simply wonderful, especially for students of branding. You'll read about grade school kids making Nike sneakers as "an educational experience" and a 19-year-old student being suspended for wearing a Pepsi shirt on "Coke Day." In "No Jobs," "The Discarded Factory" (chapter 9) offers the same old shocking facts about sweatshop labour with a fresh perspective which only makes the situation seem worse. Etc. 1. Where No Logo fails is in its attempt to tie these different themes together. With an attempt of this genre, it would have been very unseful to see some "solutions" or recommendations to the issue that Klein raised. For instance, she argues that companies have to spend more money on 'branding', and this is why production is moving to sweatshops. Companies can't afford to have factories and a brand, so they ditched the factories. But its not just the big brands that are made in sweatshops. Nike runners may be made in Indonesia, but so are the local-brand runners in your supermarket. Gap shirts are made in sweatshops, but so are the shirts in the department store. The sweatshops aren't a result of branding, they're a product of the desire of companies to cut costs. Some companies will then keep their prices low, while others will spend a lot on advertising, but hope to make even more by charging higher prices. In the end, Nike is bad, Gap is bad -- but what should they do in lieu of their current practices? 2. Related to the above point, Klein skimps on examples of the "good" companies or what is commonly tossed around as "best practices". 3. Perhaps many of the corporate ties within the open source software community are very much along the lines of Klein's notion of an ideal balance between corporations and communities. A discussion of open source projects -- especially coming from a journalist of the caliber of Naomi Klein -- is amiss. I really liked the fact that N. Klein always gives references, and examples of what she tries to demonstrate. Great book,just loved how it made me see the things that were so much part of my life and that I wouldn't question. Now my views are different, I catch the logos, I catch the subtle messages, I catch the hidden messages that drive me into the consumer that I am, and understand better why, how and who is behind all of it. This book is well researched, and even if written almost ten years ago, not much has changed in the world of marketing and how we are tricked into buying the things we don't need from across the world. Klein's thesis is interesting if a bit predictable when she writes on the ubiquitous nature of advertising and the branding of society. Who, really, likes to see the same stores of the Left Bank of the Seine as they do at the local mall? But on everything else she is either off point or simply wrong. She writes that third-world countries have not benefitted from free trade and financial market liberalization. This is simply not so. Economist Xavier Sala-i-Martin of Columbia University shows that the proportion of the worlds population living with less than $1 per day of income (a conventional definition of the very poor) has fallen from 16 percent in 1970 to 5 percent in 2000. Similar figures arise for other definitions. Sala-i-Martin also shows that within-country income and wealth inequality has also fallen. Romain Wacziarg and Karen Welch, both of Stanford University, showed that trade liberalization in the third world has been associated with annual per capita growth rate increases in those countries of 1.4 percent, on average. Over extended periods of time, this is a very substantial effect. Klein points to Mexico as the "proof" of her claim to the opposite, but Mexico is the exception to the rule and its poor performance in the 1990s had to do with a financial crisis and Mexico's mishandling of the ensuing banking crisis in that country not globalization. In this regard, it is worth noting that Klein takes the 1998 Asian financial crisis as evidence of the failure of globalization. It was a measure of failure something--probably several things--but liberalized trade and globalization are not two of them. The period studied by Wacziarg and Welch includes the Asian crisis and they still show substantial benefits. Her claims to the contrary are examples of the worst kind of Post Hoc Ergo Prompter Hoc logic. Klein certainly doesn't compromise on No Logo; its a long book, difficult at times; but fascinating to the non-expert reader. There have been countless similar books since but this is a somewhat groundbreaking work and a great synthesis of the various anti-globalisation arguments. Its scope is large, from how things are marketed to third-world exploitation to the anti-globalisation movements like Reclaim The Streets, she paints a picture which in turn makes you furious and then empowered and ready to act. Well thought out and provacative. I found this to be somewhat of a depressing book. I never really understood the full concept and ramifications of "branding." What you may think is a tiring sequence of commercials and have a more nefarious background. Naomi Klein paints a rather bad image of the corporations on how they exploit third world nations to their own gain. Free Enterprise zones sounds really good but usually end up being a place where corporations can skirt laws about unionizing, worker safty, and the environment. I remember reading the issues of the garmet industry 100 years ago and yet many of the same tactics are in play today. What is sad is the fact it can go on because the people wish to have their trinkets and cloths for the cheapest rate possible. I thought was interesting is the effort of branding and I don't know if it was a factor but to develop and defend a brand; it would make sense to shed production to "free enterprise zones" to where you can reduce your labor costs to .23 an hour. The savings allows for further marketing efforts. One thing that disappointed me was the truth of the efforts of the Kenyan marathon runners attempting cross country skiing. Rather then being people who thought "I would like to try this" it turns out to be nothing more then a marketing stunt by Nike. Much of the book delves into Nike and Phil Knight. Basically he can be labeled as the poster child for sweat shops and branding. A surprising revelation was Kathie Lee Gifford and her act of contrition over the fiasco of her clothing line using sweat shops. She actively tried to to change things while the saintly Michael Jordan simply shrugged and said his job was shooting hopes and not politics when confronted with Nike's actions. I found the section about Shaq and Nike interesting. I remember when Shaq entered the scene and many thought he was the successor of Jordan for Nike. It turns out Shaq decided to develop his own brand and studied a little marketing and when Nike found he wasn't going to fall in line, they decided against him. I have often heard and argument in defense of sweat shops. Basically, they improve peoples lives by giving them options they would not have. After reading Klein's descriptions of "free enterprise zones" I don't understand how indentured poverty is better then poverty. The final chapter on culture jamming and the efforts of people to show the seedy sides of corporations was interesting and it gave a small sense of hope after reading the doom and gloom of the previous chapters. I used to think the WTO protesters were nothing more then anarchists who were just want to trash the area where ever they went. However, through Ms. Klein I have a different view point. All too often the phrase of power and corruption comes into to play. When great money is at hand the "moral" system changes to suit the needs of money. Often you hear the free market argument of if you don't like what the company does, go to the competitor. The problem is they are doing the same thing. When Nike fell from grace, the competitors rose to take it's place in the same actions. The chapter does make the case that the best way to make a company act in a "moral" standing they often like to portray is to bring attention and educate people to the ramifications of their purchases. It can be a powerful weapon as a quote in the book pointed out "It can take 100 years to build up a brand and 30 days to knock it down." There are many defenders for corporations but people should think about a comment in the book where it was said Nike thinks you are worthy to purchase their shoes but you are not worthy to make them. All in all this book is a "must read" no matter what side of the argument you stand. It is a well thought out and provocative to read. NO LOGO will fundementally alter the way you think about the world. A deep and complex look at the modern predicament. In No Logo, Naomi Klein investigates and extrapolates on the growing political trend of "brand-based activism". Through her own experience, travels, interviews and research she puts together an amazingly engaging and poignant book. Within these pages, Klein illuminates the ambiguities of modern dissent, the interconnectedness of predicaments the world over. From the "reclaim the streets" parties in Europe which demonstrate for the need for open public space, the struggles of garment workers in the Phillipines and elsewhere, unable to earn enough to live, unable to organize, unable to achieve a decent standard of human dignity, merely used because they have nowhere else to go, used as cheap labor... to the shock tactics of Greenpeace and the infamous McLibel trial, and so on. We begin to see the web connected, how many small movements are fighting common enemies, fighting for common goals. How none of it is easy, or even easily definable, except citizens continue to find themselves protesting the largest symbols of corporate greed and unaccountablity. Naomi Klein has successfully documented the growing concern about consumerism in North America and around the world. What Klein has done in 'No Logo' is put into words a movement that was struggling for recognition. With 'No Logo', Klein has surmised the concerns of those who protest [in a literal or figurative way] the further reaches of globalization. She has also made their plight more understandable and backed it up with extensive research into the effects of corporate practices on everyday life. Klein discusses among other things, the importance of the Logo in modern society and it's growing association with, not just a brand, but a way of life and how this can be dangerous to many. In a time when the democratic left in the western world was moving to the right and third way politicians like Bill Clinton and Tony Blair where preaching the benefits of a world completely liberalized by trade, Naomi Klein released international bestseller No Logo, a book that exposes the dark side of globalization. The book which is broken down into four main parts, no space, no choice, no jobs and no logo presents us with a segregated world where people in the impoverished third world are exploited to make profitable goods cheaper for those in the first world. The first segment of the book "no space " gives us a brief history of the shift in the corporate climate that desired to rid itself of its encumbering manufacturing sector in order to free more capital for the real money maker, advertising. We are shown a first world where the young are being socialized through corporate advertising to become docile subservient consumers in society. The maniacal and sinister corporations seek to stretch forth their tentacles and bombard every public space with corporate logos, soon no place will be safe, the schools, the parks and your streets will all be filled with advertising coercing you into their arms. Naomi Klein of course is writing from a left wing perspective and she herself inadvertently admits that her parents who were leftist hippies during the sixties socialized her. Because of this Naomi at times becomes blinded by her own fanaticism making some of her arguments easily dismissible. She blames the world takeover by corporations on a dissolving public sector that shrunk once computer technology made it easier for corporations to transfer money globally, allowing them to flee countries with high corporate taxes. She, however, forgets that people used their freedom of choice to elect neo-liberal governments who accelerated these policies. There is no mention of the instable energy prices in the seventies that made it difficult for social democratic governments to effectively operate with a growing population. Throughout the book she only chooses to acknowledge the virtues of one side of the political spectrum while condemning the other. Part three of the book is where Naomi shows her strength as a writer and researcher as she visits the free trade zones of the third world and exposes the dirt behind the corporate logos who force poor countries into a bidding war to attract western capital. Part three is an excellent read but she fails to go into detail as to why the workers have journeyed miles to work in these slums or why countries are so desperate to allow foreign companies to operate tax free, leaving her arguments once again to be easily dismissed. I picked up author Naomi Klein's book on a whim, after seeing it on sale at Amazon.ca. Thinking that it may give me some insight about the annoying protesters that I always hear about whenever there's some major world leaders conference, I brought it to the front and purchased it. I was pleasantly surprised by my purchase. I've always been an anti-logo person. I wouldn't on my life be caught in a Tommy Hilfiger shirt, or GAP jeans, or even Nike shoes. I also know that personally, I am starting to find the loss of our public space and unbranded areas in my urban setting to be quite offensive. What No Logo did for me, was to help me look deep into these corporations mindsets, to understand what is happening, and figure out exactly what is wrong with these aggressive tactics, and the best means to channel the rage I have against these multinationals. The book is very well researched, and it is written in a very easy-to-read manner. The ideas flow nicely one into the other, and there are a lot of ideas explored in this book, while more times than not both sides of an argument are presented. There were times, however, were the author uses the book as her own personal platform for other issues she seems to feel strongly about. From her feminist views to the ones rights for Jewish Lesbians, I sometimes felt that her rants had no place in the book. But these were pretty minimal, and easily overlooked. During the course of the book, I found myself wondering what I could do to help in many situations, and there are definitely answers to these questions. I was also pleased that these answers didn't come in the form of promoting the radical protests that a lot of boringly average middle-class kids with nothing better to do seem to have embraced. Naomi Klein covers every aspect having to do with marketing, advertising, brand names and production of all of these. Her points about these subjects are clearly thought out and researched. She claims that more and more space is being branded, even space that is traditionally thought to be "free", such as public squares. Advertising is even pervading places where free speech should be primary, such as grade schools and universities. Marketing is no longer about selling a product, but selling a brand name. This brand name is then associated with certain desirable characteristics that are translated onto all products. This makes is possible to market such diverse "commodities" such as public space, concerts, cloths, people and furniture under one brand name. Since the corporations are increasing larger and more encompassing they yield so much power that they limit what products are available and where they can be purchased. This means that the corporations decide what news stories we see and what is available to rent in the video store. Also they make sure that which video store we go to and which television channel we watch. Since there is such a demand for increased brand awareness corporations are willing to cut costs anywhere they can to increase the scope and size of their brand. They must do this while slashing costs at the same time. This means that factories are moved out of areas that demand decent working conditions in favor of less stringent environmental restrictions and cheaper more compliant labor is the norm. This also means less secure full times jobs and more temp jobs, part time jobs and outsourcing. All of these factors combined create a culture of disenchantment against the big brands. The backlash ranges from the demand for better salaries and benefits, to the exposure of questionable business practices, and to the lack of acceptance for advertisements permeating all parts of life. The techniques used to fight back are picketing, protesting, altering of billboards, educating the public about what keeps the corporations profitable and the workers poor, and developing of anti-ad campaigns. 1. Corporate branding pervades our lives. It is encroaching on our public institutions and there are less and less places that are free from the noise of advertising and logos. Also, brand quality now takes a back seat to brand image. 2. Globalism is creating a permanent third-world underclass that makes cheap stuff for shady contractors, hired by large firms who then market to us in the West. Most large retailers no longer manufacture anything and the companies that do are scattered across the poorest regions of the world, their labor vigilantly hidden from the consumer. Does a visit to a slaughterhouse make you hungry for a burger? A visit to a Chinese sweatshop might bum out your next trip to Old Navy. 3. Contract manufacturers absolutely do provide jobs in countries where options are limited but wages are often so low and conditions so brutal (not to mention the institutionalized union-busting), that they would absolutely shock most of us mall rats. On top of that, corporations generally sell the products at huge markups and reap obscene profits. That's called exploitation and it's immoral. No Logo is the most detailed, fact giving book ever written on modern corporate policy, and how it affects ordinary people around the world. Covered in this book are topics like Export Processing Zones (AKA sweatshops), Western employment, corporate advertising styles, corporate influence over public space, how the Reagan administration's policies caused schools to have to turn to corporate sponsorship and how so many professors felt betrayed when their schools sided with sponsors when the results of an experiment did not turn out the way the sponsor planned. In fact, the book's content is so broad that it has to be divided into different sections that can easily be like books in themselves. Klein is obviously an activist, so the reader can be assured that the book will be written from a very progressive standpoint, and will, "pull no punches," when assigning blame when dealing with the problems facing the industrial world. This is a sharp contrast to the book, Globalization and its Discontents, which was written by a former member of the World Bank and Clinton's administration. I think that Naomi Klein is one of the writers best suited to describe modern corporate behavior. Almost every instance she gives is backed up by a personal experience, such as traveling to Indonesia and interviewing EPZ workers or to Manhattan to get a perspective of those working for big chain stores in America and to explain what the companies' propaganda to their workers is. And so each fact giving chapter seems to come bundled with a story of one of, "Naomi's Adventures," which leaves the reader feeling like he/she has a new understanding of an issue. In mid-nineteenth century England, poet William Blake indignantly portrayed poor children sneaking a peek from the windows of the factories where they slaved fifteen hours a day, to watch the rich and beautiful cavort in the meadows with their hounds and horses. In the United States of the 1920's, Socialists reveled in contrasting the plight of the downtrodden workers with the opulence of the Robber Barons who lived off their labor. Today, to someone sensitive to the plight of the world's poor, little could be more repugnant than the contrast between the vulgar consumerism of the masses in the advanced capitalist economies and the lowly condition of the destitute third world workers who sew their clothes and craft their sports gear. Naomi Klein is a prominent spokesperson for those disgusted with this contrast between rich masses in the developed countries and poor masses in the backward countries, the former benefitting obscenely from the low wages and poor working conditions of the latter who work sweatshops on their behalf. Klein wrote in a period when Nike, Wal-Mart, and other mega-corporations were under severe attack for oppressing their domestic and foreign workers. She and fellow activists had hoped this anti-corporate upsurge might turn into a full-fledged revolt that would dramatically improve the lot of low wage workers around the world. In the second edition of No Logo, which appeared in 2002, she notes that "These struggles may seem slight in retrospect, but you can hardly blame us media merchants for believing that we were engaged in a crucial battle on behalf of oppressed people everywhere: every step we took sparked a new wave of apocalyptic panic from our conservative foes." (p. 110) This movement has now subsided, and much of No Logo is an analysis of what went wrong. Klein's main argument is that modern advertising is so powerful that it is capable of co-opting the anti-corporate movement and turning the aspirations of its supporters to it own advantage. "Our sworn enemies in the `mainstream'---to us a giant monolithic blob outside of our known university-affiliated enclaves--didn't fear and loathe us, but actual thought we were sort of interesting. Once we'd embarked on a search for new wells of cutting-edge imagery, our insistence on extreme sexual and racial identities make for great brand-content and niche- marketing strategies. (p. 111) Culture jamming, the attack on corporate logos in massive demonstrations of disaffected youth, enjoyed a vigorous presence in this period, Klein notes (p. 287), but its major themes were quickly adopted by the advertisers to sell more stuff. (p. 297). Nothing, it would seem, can dent the sophisticated fa?ade of the taste-makers. Naomi Klein is a fine writer with a real social conscience. While she wears this conscience on her sleeve, she never lapses into a strident or sanctimonious style. She hasn't a clue to the real nature of the phenomena with which she is dealing, however. Her major thesis lacks even prima facie plausibility. There is little plausibility to this argument. Is it not reasonable that in earlier times firms produced goods in the home country because they had great regard for their workers. They did so because home-country workers provided lower unit labor costs. Contemporary firms locate internationally when they think they can make higher profits that way, not when they lose respect and regard for their domestic work force. Moreover, aside from a fringe of activists, consumers are generally not willing to pay significantly higher prices for goods in order to benefit third world factory workers. This is not because people are selfish, but rather because the low-wage workers who produce their clothes and shoes have little impact on the daily lives of consumers, and only the most concentrated political agitation can raise this impact, and then only for a short period of time. It is also doubtlessly true that even a sustained effort to raise the wages of sweatshop workers would have little effect on the rate of poverty in third-world countries. More effective by far would be by the World Trade Organization succeeding in lowering tariff barriers against the import of third-world agricultural products, and by socially progressive groups and governments subsidizing third-world movements for democracy, representative government, civil liberties, the right to unionize. Klein correctly notes in regard to her study of the struggle of Philippine workers: "Because the Workers' Assistance Center's chief mission is to empower workers to stand up for their rights, WAC organizers don't much like the idea of Westerners sweeping into the zone brandishing codes of conduct, with teams of well-meaning monitors trailing behind." (p. 439). Like many progressive supporters of the third world poor, Klein's instincts are anti-globalization and even anti-market. Commenting on a picture of economist Milton Friedman being assaulted by pie-wielding demonstrators, Klein identifies Friedman as "architect of the global corporate takeover," and asserts that he is getting "his just deserts." (260) Friedman's strident free-market rhetoric is of course quite over the top, but in fact, third world countries that have attempted to compete in the world market place rather than shelter themselves from it have done quite well, and the recipes of Klein et al. are, conversely, doomed to impotence and failure. The idea of offering sweatshop workers decent wages is a wonderful one, but suggesting that this might be a way to improve the lot of the poor in the world economy is ludicrous. Perhaps a country with mountainous oil revenues can play at sounding anti-capitalist (e.g., contemporary Venezuela), but the future of prosperity in virtually all poor countries depends on developing markets and state institutions that support markets in a synergistic and democratic manner. It is up to us to help them attain this, rather than feeling good about ourselves because we pay an extra few cents for "fair trade certified" coffee beans. "No Logo" outlines anti-corporate visions on the war against greed. Naomi Klein takes an interesting approach on this topic so widespread written about today in society. Klein's approach towards the matter is that she divides reality of what corporations do to the world into four main categories. In the first section of the book entitled "No Space", Klein states on page 3 that, "Corporations must primarily produce brands as opposed to products." This means that real work lies in marketing, not manufacturing as it was in the past seeing that branding is a relatively new concept that has evolved over the last few decades. Klein goes on to say that companies sell brands before product, because their eyes are fixed on global expansion and even more fixed on making maximum dollar profit. In "No Choice", the second main section, Klein examines her own personal experiences of involvement with corporate synergy mania in popular culture. There were many other points in the area of the book, but this one stood out the most to me because it makes a person realize how they themselves as a child are basically born into corporate synergy, and very hard to avoid at a young age. "No Jobs", is the third category Klein uses to demonstrate that corporations are taking jobs out of the economy. On page 195 Peter Schweitzer president of the advertising campaign for J. Walter Thompson, says, "The difference between products and brands is fundamental. A product is something that is made in a factory; a brand is something that is bought by a customer." Many companies now bypass production completely, and hence leave many former paid employees families hungry at the dinner table at night. The fourth and final section is named "No Logo." In this section, Klein talks about culture jamming. This term culture jam might best be defined as media hacking, information warfare, terror-art, and guerrilla semiotics, all in one. These examples all work toward the idea that people do not need to be brainwashed into doing something that somebody of wealth wishes you to. This action is seemed necessary by many because they feel that most people don't know any better than to believe what the media tells us. Culture jam is meant to educate those who are so captivated by companies branded products that people fall into an idea that they need a product that a large corporation who cares nothing about them is making. This book was a real eye opener. I was surprised to read about some of the slimey business practices of big companies like Nike, etc. This is one of the worst books I have ever read. Inconsistent, illogical, and just plain dumb. I have read material that brings up real arguments against global branding and capitalism and although I disagree with them, I think that the authors have put some intelligence into the arguments. Klein represents the worst of the populist anti-globalization movement and I find it depressing that so many people here praise her so highly. What are the effects of multinational corporations in the Branding Age? Naomi Klein tackles that in this seminal work on the subject. While somewhat dated (published in 2000), it gives the most comprehensive picture of the transition corporations have undergone from providing competent products and services to providing ubiquitous branding and advertising to produce loyalty and sell peripherals. This book gives the total picture of the devastation left in the wake of total corporate dominance in the U.S., Canada, and worldwide. As she details, what has emerged in the last half of the 20th century is a new kind of totality - an economic imperialism spearheaded by Nike, The Gap, McDonalds, Shell, and Microsoft and their lawyers, contractors, and advertising agencies. As they break open markets, crush competition, and lower wages across the globe they've gotten so powerful as to dictate to scores of countries what their trade and economic policies are going to be. These policies are always anti-Union and terrible for workers, leaving nations worse off than before they were Industrialized and Advertised - creating massive wealth gaps and uneven distributions across the board. The four major sections of the book: No Space, No Choice, No Jobs, and No Logo, each show in example after example, case study upon study that advertising is the product now and the more money spent in that avenue, the more profitable the corporation can be while taking every opportunity away from the poor and disenfranchised, forcing horrible conditions and worse jobs on them, and decreasing their access to health care and nutrition. This is not an accident. This is a concerted policy foisted upon the world through the corporate enforcement arm of the WTO, World Bank, and U.S. Military. Is it hopeless? Well, civil disobedience is one way to combat the trends and takeover and Klein offers many suggestions and examples in this book. However even she admits that the situation is bleak. Good luck . . . and good read. I had, independently of anyone else's suggestion, noticed some disturbing trends in American culture. One, advertising was suddenly becoming so aggressive that my head hurt every time I looked at the TV, computer, or street. Two, it was becoming increasingly difficult for my friends and me to find good jobs--everything was temporary, without good pay or benefits. Three, I could no longer find clothes or other products that had been made in the U.S.A., and I was beginning to be suspicious about labor practices abroad. As different foces such as free trade, globilization and increases in advertising budgets, our society and economy will change as a result. Nomi Klein takes a look at these different factors in No Logo in which she tries to make sense of all these differenat changes. Klein takes a stab at the growing levels of advertising and corporate sponsherip in society such as corporate ties with schools such as having pepsi and subway deals with schools as well as the extent to which corporations such as Nike and Marlboro create images of successful athletes and wide open cowboy country to sell its products to people such as inner-city youth and workers in third-world cities. Klein also takes a look at how corporations are limiting our choices in terms of product. There has been a proliferation of franchising and expansion of companies such as Wal-Mart, McDonalds, Subway and so forth over the past years that our country is looking like one huge strip mall without much character. Mergers such as AOL and Time Warner futher consaladate the media so we have fewer voices being heard. Because of growth of corporations, they can affectively silent views such as Wal-Mart refusing to carry certain albums and book stores refusing to carry certain books. Furhter more, she begins to deal with jobs. Increasintly corporations are moving to the third world to open up factories while closing factories in the united states thus sucking away what was decent paying jobs and creating poverty wage jobs in the third world. When in retail or food services, corporations are eliminating full time jobs in favor of part time jobs such reducing people's ability to have a decent paying job. Finally Klein ends wiht how people are begining to challenge corporate dominance such as through through boycotts and grass roots activism. People have been successful in gettinc local and state governments to stop doing business with corporations that deal in certain countries with questionable governments such as Burma and Nigeria. I began this book ready to have my indignation tweaked, and 200 odd pages in, sated with tales of malnourished children working 18 hour days in crowded and dangerous conditions to assemble my clothes, computer, furniture, car, and probably grind my coffee too, my indignation nerves are ringing. Some of the simpler aspects of Klein's doctrine are things I can appreciate. I like buying locally designed and made products, for example, and would rather spend more money on something not knocked off in a sweatshop by an over worked child. The last time I was back in New Zealand, I noticed that a favorite inner city shop where I had bought locally designed and made clothing had vanished, victim, no doubt, to the gravitational pull of the suburban malls. Likewise, my hitherto favourite New Zealand outdoor equipment company, Macpac, has just adjusted its manufacturing policy to bring it in line with "market reality", laid off a great number of staff in NZ and shifted all its production to the third world. I can see the relevance of what Klein is writing about, but honestly I can't see myself finishing this tome, just because of the indigestible style in which it is written. Naomi Klein is evidently critical of super-brands and their invasive effect on society, but sometimes she seems so enmeshed in the language of marketing mumbo-jumbo that it's hard to find the meaning in the message. Here's an example from the section ALT.EVERYTHING: "As the success of branding superstars like Nike had shown, it was not going to be sufficient for companies simply to market their same product to a younger demographic; they needed to fashion brand identities that would resonate with this new culture." Later in the same chapter, she notes that Tony Blair is "a world leader as nation stylist [who] successfully changed the name of his party from an actual description of its loyalties and party proclivities...to the brand-asset descriptor "New Labour". His is not the Labour Party but a labor-scented party." Much of the marketing speak Klein adopts when discussing the influence big brands have on the western world is in inverted commas. However, if you aren't used to reading phrases such as "experiential shopping" and "fully branded experience", reading paragraph after paragraph larded with these expressions becomes much like the mind-numbing experience of wandering endlessly through a shopping mall. After a few hundred pages I wasn't sure whether Nike manufactures shoes or thin air, and whether I should be congratulating them for their business savvy in ripping off the gullible public or protesting their deplorable third world labour practices. Desperately Looking for Reasons to Hate Capitalism? Ms. Klein must be one of the great minds of our time. After all, only she has the clairvoyance to see through swooshes and golden arches, while the masses are helpless against the deceptive powers of huge multinational corporations. Please, give me a break. Rather then briefly go through the long list of faults in Ms. Klein's book, I think it would be better to elaborate on just a couple of the book's issues. One of the facts that Ms. Klein sites repeatedly to show the power of corporations is that out of the 100 largest economies, 51 are corporations and 49 are nations. Believe that? Did you also know that out of the 100 largest apples, 51 are oranges? To come up with her bogus figure Ms. Klein compares company sales to GDP. Unlike GDP, corporate sales figures are not a value-added measure. The picture is much different, when you actually compare figures that are comparable. The value-added of the 50 largest corporations are only 4.5% of the 50 largest nations (Legrain, 2002). Worst of all, Ms. Klein is far to intelligent accidentally make such a juvenile error. The only conclusion I can draw is that she knowingly uses ridiculous figures like these because she recognizes that her target audience doesn't know any better. If you weren't able to pick up on this obvious inaccuracy, then there's no way you could discern the more subtle faults of logic in Ms. Klein's eloquent prose. I also want to comment on the huge, greedy corporations exploiting workers in third world countries. Let's say there's a Nike factory in some third world country whose workers are being paid what we would consider some pittance. Ms. Klein would have us believe that these workers are being exploited (as would all you anti-globalization people). However, she forgets the most obvious fact. These workers have these jobs because there aren't any better available. Do you think that if the factory were to shut down, magically better jobs would appear, schools for poor children would open, and their poverty would be alleviated? Do you think these poor people are so incredibly stupid, that they do not realize they could live prosperous lives if only they stopped working for Nike? Of course not, because no such opportunities exist. But Nike is a rich corporation. Surely, they can afford to pay more to these people. Indeed, they can afford it, but alas, in the evil capitalist system companies make goods as cheaply as they can to maximize profits. I have a solution though! If you want to help poor people then you should take responsibility for it yourself. You send money to charity. Better yet, buy Nike shoes, provide these people with a better job then they would otherwise have, and send money to charity. Of course, most convincing of all is the fact that eventually these poor people get better and better jobs all with the help of globalization. Don't believe me? Ask the Taiwanese, Japanese, Chinese, people of Hong Kong, or South Koreans. Actually, you might get a more definitive answer if you asked the North Koreans; or asked the Chinese whether life was better or worse before their government began opening up trade. No Logo is a book about the capitalist takeover on the world. For me I was real excited to read up on how the corporate world is screwing us over taking up every nook and cranny of the public and private space. The brand is almighty, and everyone without a keen eye worships the brand (ie Nike). Its a bit out of date because there are newer ways for the brand to seep into the public conciousness that aren't explained obviously before cell phones got bigger and with the popular explosion of online streaming video. The people who complain that this book is one big lie are overlooking one significant fact: we can see what is going on for ourselves. Anybody can see that brands are everywhere, advertising is getting into every nook and cranny of our daily existence, and that corporations are increasingly becoming more powerful. 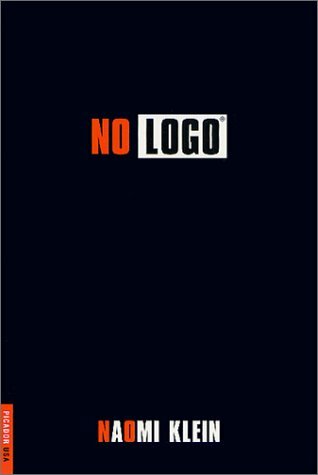 "No Logo" does a great job of bringing these ideas together and explaining just where we are in today's corporate climate. Is the book perfect? Of course not. Both sides of any case can spin the facts in their direction. As readers we don't take every single thing we read to heart, we have to read critically. Klein sometimes suffers from the fact that she feels so strongly about the subject and has surrounded herself with people and information that concern it. She seems to think the opposition to branding is more widespread than it really is. And she has a tendency to get caught up in villifying specific companies for every single thing they do, even policies that a good company might want to implement. But none of that takes away from the fact that most of her book is dead-on correct and has the ability to really focus our attention on why the growth and extreme advertising tactics need some opposition. This is a perfect book for the average consumer who may not know what branding is doing to our society. Klein brings it home and makes the consumer realize that it is their dollars and their decisions that affect everything this book discusses. I found this book to be very interesting, and disturbing. Klein is certainly a Leftist, and generally as a conservative I would dispute much of her world-view but with the first half of her book she is on to something. I believe that the second half is less successful, and I do not share her idealization of graffiti artists and anti-global activists, but overall her book is a provacative and important one. Read and beware. I would like to respond to an earlier reviewer's comments, which many of my friends have directed me to when I told them of the book. Tristan from Australia finds fault with a graph in her book (not indexed for inflation) and then sets to beaking her over the head with it. I think he misses much of the point of her book - even if her graph is off. There is no question based on anecdotal evidence alone that advertising and the pervasiveness of "branded" space has increased. Look at modern sports stadiums, say the NFL - they're all named after corporations. The athletes at "FedEx Field" are all wearing brands that the team has negotiated (and been paid large sums to wear) - and they can be fined if they aren't wearing a "Starter brand" cap when they sit on the bench, etc. They then sit down and drink a Gatorade, while they watch the Coca-cola sponsored half-time show featuring Michael Jackson, Britney Spears or whoever the company believes they can best get to flog their product. The highlights from the first half will be then shown on the X-brand half-time show, and then recreated using graphics from EA Sports John Madden game. You could avoid all this and go to a movie, but first you'll have to sit through advertisements before the movie - and not just for upcoming movies anymore. First you'll be shushed by Halley Epsenberger while she's cramming Pepsi down your throat - all this after you spent $9.50 to be a captive audience for commercials - at least when you watch basic TV the excuse that the advertising is paying for the programs make sense, but this? And then you can be clever and see how many products have been placed in the movie. If it's James Bond you can see him wearing X-brand watch, drive his BMW, and polish it off with some Tanqueray Gin - not because smooth sophisticates drink it, but because Tanqueray paid the most for it. As for her other points - she goes into great depth about how we're becoming fungible goods as workers. An example I remember from the book is that Microsoft has a core of permanent employees and true they do make good money, but half of their work is done by temps. And to ensure that temps don't try and claim anything as basic as health coverage (what would they be thinking?) they're required to be laid off for a 30 day period every year so that no one classifies them as full time workers. Walmart does get to keep prices low as the Australian writer suggested, but unlike prior employers who believed they had a responsibility to take care of their workers - e.g. Ford wanted every worker to be able to afford a Ford - Walmart doesn't care whether it's employees can afford to shop their or not. As I know from having done some work for them they're all about keeping employees employed at under 28 hours a week - again so they can keep from having to pay any benefits. Great you say - get another job, but others such as Starbucks have caught on to that and screw their employees similarly. Sure you work 30 hours a week, but the schedule is such that you can't realistically get a job to fill in the time you're not working for them, plus you get to be on unpaid call (I guess for a coffee emergency), and in typical fashion they've even done computerized studies on each employee's productivity. They know each stores peak hours, how many customers x-employee typically serves, etc. - so they can schedule the employees only for the most cost-effective time. On one hand this sounds fair, but on the other - it's completely shafting the employee - especially those that treat it as their "real" job. Given that we're becoming a service based economy, this is getting to be a larger and larger part of the public. You definetly get your money's worth. Starts well and keeps you interested for about 350 pages, At that point you wish it was over, unfortunately it continues to limp on for another 200. The question: Exactly what product does Tommy Hilfiger make? The answer: Nothing at all. In fact, when you buy Tommy jeans, shoes, and sunglasses you are specifically purchasing the right to wear the advertisement. This concept of branding is the central issue of Naomi Klein's NO LOGO. Klein is virtually obsessed with the pervasiveness of branding and also its inherent preposterousness. This obsession is the driving force behind NO LOGO. This book pulls the reader in, at the same time convincing and forcing him or her to think of the reasons for making brand purchases and also think of the undeserved money it makes for entirely marketing-based corporations that make no products. Until I read NO LOGO I had no idea of the magnitude of branding and the marketing industry created to push it. I was shocked to read that this was the real reason school kids have been beaten, even killed for their shoes. Branding denotes status, and there are entire corporations looking to sell this way. Looking to sell this way to children, with utter disregard for the physical (and self-esteem) dangers this poses. Think about Mattel's Barbie brand. Everything Barbie...from dolls to drapes to clothing. Branding has become the ultimate in conspicuous AND vicarious consumption. Each chapter begins with a graphic depiction of some form of branding, and this is very helpful to get Klein's message across. The ads that are routine in everyday life seem grotesque and manipulative in this book - and that is Klein's intent. Think differently, think deeper, she seems to urge. I am old enough to remember a time when characters on television and in movies drank SODA and not PEPSI. I thought (and still do believe) that the reason for SODA was to make people more able to relate to the character...one would have no way of knowing how much Character X paid for his SODA. Today, however, it is more important in society to strive to become as affluent as someone else by paying extra for a name brand. "Drink Pepsi, and you will be as cool as this beautiful actor." No Logo is a well researched book that documents many of the things that are wrong with our consumer culture. While "No Logo" is definatly worth your time Klein's argument has one reoccuring flaw. She draws links between different phenomenon without showing how they relate to each other. According to Klein the switch from advertisements focused on quality to appeals to emotion made the brand more important than the product. In order to more effectivly manage the brand companies began outsourcing the task of actually creating the product, often overseas. This is where Klein's argument comes apart due to causal relationships that are not satisfying. She blames the poor working conditions found in many third world factories on the culture of brand awareness itself. Rather than focusing on the very real economic and legal issues at play Klein chooses to focus on describing how people have attacked advertisements and other symbols. Since I work in marketing research I guess I shouldn't wish for the destruction of all brands. But I would definitely be more than happy to change careers if it meant I got to see Nike, Monsanto, Walmart and all the other destroyers of our (world) society topple. The only reason this book didn't get 5 stars is that it made me so angry and made me feel so helpless. Don't get me wrong, Ms. Klein also adds a healthy dose of optimism about how "the movement" has evolved and continuously found new ways to out companies for their misdeeds. It was also very enjoyable to see how corporate missteps caused them even more grief (and millions of dollars). McDonald's execs saying, "Coke is healthy, it has water in it." made me smile for days. No Logo is a sobering report on the current state of globalization and it's potential future impact. The nature of big business is ruthlessly criticized throughout (and rightly so), but is accomplished in such a mature and intelligent way that by the end of the book I was ready to participate in my first anti-globalization rally. A must-have book for those seeking to understand this current phenomenon and how this process is unfolding for millions around the world. Over the past few years, branding has become a huge phenomenon. And it hasn't just occurred in the United States. Branding has scaled the globe and is found almost everywhere in the world. Why is this? In the book, No Logo, Naomi Klein searches for these answers. Starting in the late 80's, management theorists developed an idea that would change the concept of products forever. Instead of just producing products, multi-national corporations would primarily produce brands which were images meant to conjure up feelings and sentiments. In order to do that, corporations needed to find ways to sell their products to consumers. By increasing expenditure in advertising and inventing eye-catching slogans and pictures, people were more likely to buy these consumer goods. This formula proved very successful and has only gotten better for corporations. However, as corporations merge together, they often become too strong and powerful. When this happens, it seems that no one can stop them. Money is of prime concern which means that they will do anything to stay at the top. They don't care about exploiting workers of 3rd World countries or even their employees at home; all they care about is making a profit. But it's not just about making billions of dollars that worries people. As Naomi Klein states, "this corporation obsession with brand identity is waging a war on public and individual space: on public institutions such as schools, on youthful identities, on the concept of nationality, and on the possibilities for unmarketed space" (Klein, p.5). I really enjoyed Naomi Klein's book for several reasons. It is clear that she put a lot of time and effort into writing this book. I learned a great deal about the real world of advertising and marketing and how corporations have tried to incorporate brands as not just products but a way of life. So far they have been hugely successful. With her use of examples, she shows how brands have taken over peoples' lives. Not only are people consumers of products, they are constantly bombarded with colorful images and brand names wherever they go. And in an attempt to expand and get bigger, corporations are shutting down individual businesses around the country. As a result, people are forced to buy from these corporations and their brands. Naomi Klein sketches perfectly the major shift in corporate strategy today: transnational companies are not interested in production anymore, only in branding: products are made in factories, brands in the mind. Branding creates big margins, production in home countries meager earnings. This strategy causes monstrous layoffs in the First World and creates EPZ (Export Processing Zones) in the Third World. The jobs they need are predominantly outsourced, or are McJobs (no `adult wages') and temporary stop-jobs. The First World stirs fierce competition between Third World countries in order to get rock-bottom prices for their `branded' products, creating colossal margins in the home countries. Wages in EPZs are so low that most of the money is spent on shared dorm rooms and basic food. Workers cannot afford the consumer goods they produce. Another aspect of our branded world is the sheer size of the (trans)national corporations created by relentless mergers and acquisitions. Their size permits them to decide what items (also magazines, DVDs) should be stocked in a store, in other words, they create a new kind of censorship. Big mergers in the media landscape allow conglomerates to produce their own news and in this sense jeopardize basic civil liberties. While Naomi Klein's analysis of our consumer planet is very revealing, the remedies she proposes are rather innocent, epidermic, symptom healing or too general: ad and brand busting, radical ecology (Reclaim the Streets), anti-globalization and anti-corporate mass protests, boycott, building greater critical social consciousness. Individual actions like attacking in court (Shell in Nigeria), revealing Nike's sweatshops or denouncing McDonald's food are ultimately not more than temporary needle pricks in elephant skins. What the world needs is a global vision, which we can find in the works of Joseph Stiglitz or (for a view from the South) Walden Bello.